Buy “The End Of America” eBook Today! America came into being, which was fine til about 1961, when the people of America turned away from the God of their fathers or grandfathers. The God of America gave America 40 years, but then came 911 and the God of America allowed Satan to work through evil Islamists and other antiGod entities to begin the destruction of America. Following His (God’s) seven year rule, in 2008 a financial collapse began and an anti-christian POTUS (President of the United States) was elected. Who Will Like This eBook? Certainly Conservatives of all persuasions. Most Christians of any denomination, most Roman Catholics, all Messianic Jews, some atheists, most Republicans. Some DFL’ers will be appalled at how their party has been taken over. Anyone who really likes to know the truth will enjoy this book. Opinions are varied in this epub and all sides are presented, to a degree, considering it is Biblically based. The God of America gave America 40 years, but then came 911 and the God of America allowed Satan to work through evil Islamists and other antiGod entities to begin the destruction of America. J.I. Kahn has an educational background consisting of a Bachelors Degree in Counseling and a Masters of Theology with licensing via the International Ministerial Fellowship. This publication is written from a “Christian” perspective, although not necessarily the “Christian” of today. J.I.Kahn has an extensive history (over fifty years) of working in prophetic situations, counseling, intercessional prayer, and leadership in the “Christian” religious community, as well as the medical field. Based on the Hebrew Sabbatical, this writer (although one year late) is currently experiencing a forty nine year Jubilee as noted in Le 25:8 “‘Count off seven Sabbaths of years– seven times seven years– so that the seven Sabbaths of years amount to a period of forty-nine years. 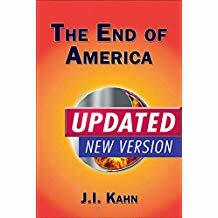 Buy "The End Of America" eBook Today!